Buder Bobcat News: Who Says that Elementary Kids Can’t Produce the News? Reporters – The METC eNews Bureau will report on happenings at the conference. All aspects of the eNews Bureau (reporters, editors, photographers, web developers) involve high school students from the St. Louis area, including Brentwood, Ladue, MRH and John Burroughs. 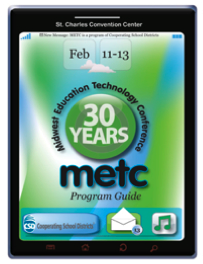 To follow the METC 2013 eNews, go to http://www.brentwood.k12.mo.us/metc2013/. Tech Support – Eighteen students in the Cisco Networking Academy class at North Tech High School will provide technical support for presenters. Graphic Design – METC collaborated with Wentzville High School graphic design teachers to find students to design the conference program cover and a special t-shirt. The teachers selected five designs as finalists and the METC Advisory & Planning Committee selected the winning designs. This opportunity will be opened to other districts for METC 2014. Show-Me a Movie is a digital storytelling contest that allows students in grades 2 through 12 to demonstrate their creativity and digital moviemaking skills. Based on curriculum and with a content focus, the movies will showcase what students know, care about, and are able to do. Cash prizes go to the school of the winning movies in each category. All winning movies are showcased at a reception on February 12, 2013 during METC. Online registration is available at www.METCconference.org. METC is a program of Cooperating School Districts of Greater St. Louis.